After a few video heavy kids posts, here’s some recent knitting instead. I know, I know, JUST what you all were waiting for. 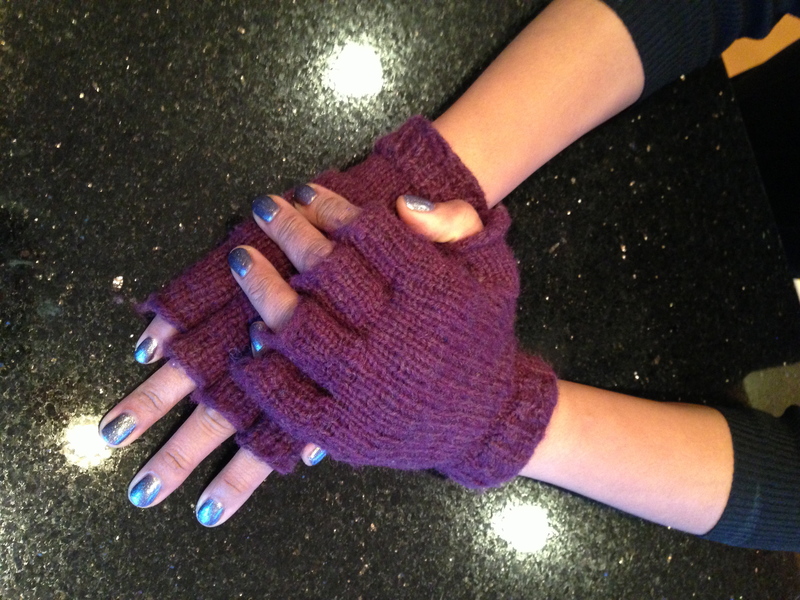 First up, a pair of fingerless gloves-the first ones I’ve ever knit with fingers. 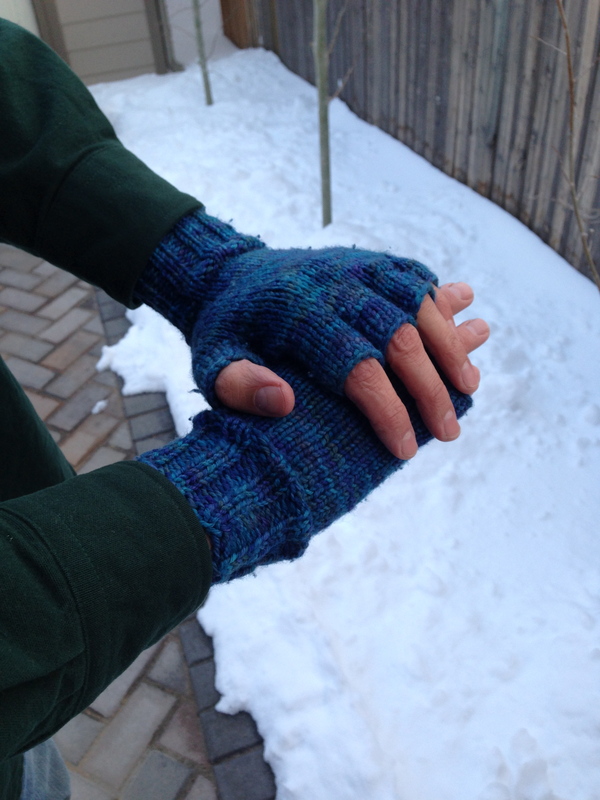 I used a men’s glove pattern (http://knitty.com/ISSUEsummer05/PATTcigar.html) (wordpress isn’t letting me link in text so I have to add it in for this post) and knit the smallest size, hoping that they would fit my huge man hands. (Yes, my hands are bigger than yours. If you don’t believe me, ask me next time and we’ll compare. I’ll win. Unless you’re a large man.) As it turns out, they were just a bit too big for me, but happened to fit someone else I know rather nicely. As a side weather note for those of you not here in Denver, that was taken TODAY. After some of the snow had melted. I’m quite happy that I’ve been lazy about getting the garden started this year. For this one I switched patterns, doing the innovative “Knucks” pattern from Knitty (http://www.knitty.com/ISSUEsummer06/PATTknucks.html). In this one, you knit the fingers FIRST and then attach them to the hand. Much faster and a lot less fixing of holes. I think if I were to make another pair of these I’d only do them fingers down. 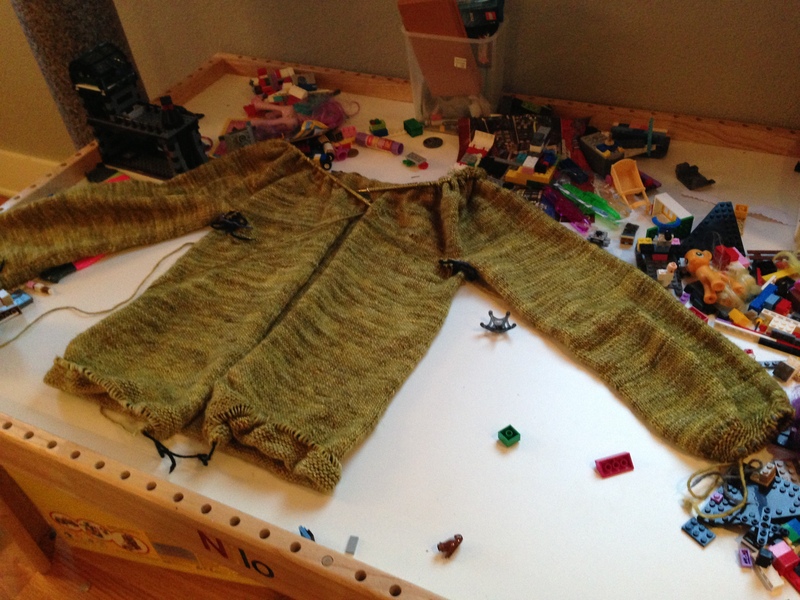 Here’s a pic of an update of the sweater that I’ve been working on since October, on the Lego™ table. This is the fabulous “Manu” by Kate Davies (http://katedaviesdesigns.com/designs/manu), knitted in my first Madeline Tosh. I understand the obsession with that yarn now. 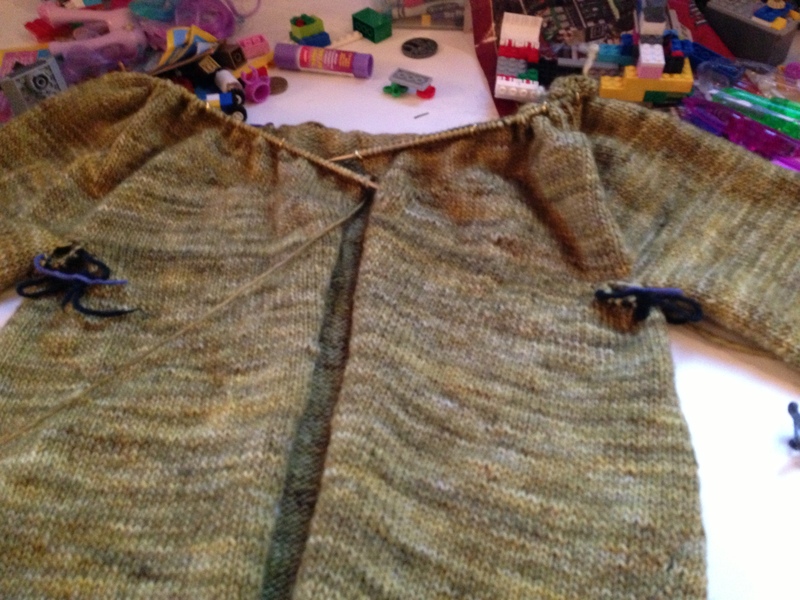 I’m hoping to get this sweater finished soon, before it’s too warm to wear it. The way things are going, that might be awhile yet.